As someone with a four year old brother, I know how hard it can be to connect to little kids sometimes. So when I heard about Ethan and Malachai Nicolle I immediately related to the story (except theirs is probably 10 times more awesome). Ethan is a 30 year old comic book artist, and Malachai is his 5 year old brother. 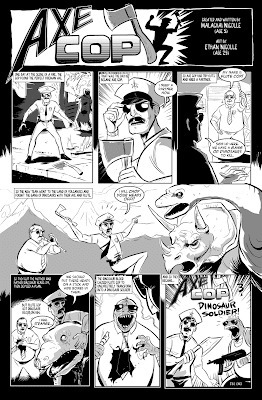 Together they created Axe Cop, and comic series written by 5 year old Malachai, and illustrated by his big brother. The result is heartwarming (brothers, aww!) and hilarious (it is a direct snap shot of the mind of a 5 year old). Read episodes of the comic here.